The Greatest Sale of 2014! After an overwhelming response for ‘The Great Bombay Store Preview Sale’ on 20th July, we are here with the greatest sale of them all – ‘The Great Bombay Store Sale’. Yes, your favourite time of the year when The Bombay Store is up with amazing discounts is here. We are offering upto 50% off from 21st July at all our stores across Mumbai, Pune & Bangalore. We have extended our product offerings by many folds this time with an aesthetic collection of Home Decor Accessories, Handicrafts & Artefacts, Mementos & Souvenirs, Fragrance products, Kitchen & Tableware and Fashion Accessories. Sometimes saving the best for the last may not be a good idea. So rush to your nearest outlet of The Bombay Store & stock up on your favourites now. Flat 50% off on 20th July! Yes, you read it right! The Great Bombay Store Preview Sale is here only to get better and bigger this time. Walk in at The Bombay Store on 20th July and avail a Flat 50% Off on your purchase. Could it get any easier? So save the date & visit us on 20th July! Introducing Daily Deals online at The Bombay Store! Who doesn’t love to save! The best thing that can happen to you while shopping online is finding a discount on your favourite product. We know it certainly lifts you up. And after providing Monthly sales & discounts, we are now going a step further to provide you with daily deals at our E-Store. So now you don’t need to drag your feet looking around for sale in-stores or waste your time searching for sales online. Just tune in to http://www.thebombaystore.com and make the most of our daily deals! SHOPPING CARNIVAL AT THE BOMBAY STORE! To a Sunday full of great workshops, activities & shopping. Yes, you read it right. We are inviting you to one of the biggest Shopping Festival to be conducted at The Bombay Store at Fort this Sunday. Witness the glory of the Jungle Culture and take a step closer to the Jungle Wildlife with ‘Jungle Lore’. The collection bears designs of animals like the Elephant, Horse, Camel & Cow in two different prints: Quirk & Repeat. The collection is launched across various product categories which include Canvas Tote, Sling Bag, Big Bag, Pouch, Cushion, Throw Cushion, Magnet, Mouse Pad, Coaster, Mugs and Shot glass. Are you inquisitive to learn something new always? Then you absolutely shouldn’t give our “Bottle Art”, “Pottery”, “Tarot Card” & “Graphology” workshops a miss! Yes, we are all set to entertain you with some fun activities like Caricature & Interactive Games. And you won’t have to go out hunting for food whilst you are enthralled in this mood for revelry. We also have delicious chaat & sandwiches. So what are you waiting for? A prodigious Carnival by The Bombay Store awaits you this Sunday! Happy Sundays – Spreading Happiness! We are brewing something very special at The Bombay Store for the past few days! And it’s time now to let it all out and tell you what are we doing to make your Sundays happier! We are bringing in a complete family excursion at The Bombay Store soon! A ‘Sunday’ that will be filled with events, workshops, exhibitions, photographers and many more activities specially designed to make your day happier! So not only can you visit us and have a really great time, but if you like challenges and are excited to showcase your skills; you can join us in this mission of Spreading Happiness. All you have to do is visit Happy Sundays! Passionate about writing? Cover our event in your blog & share your experience at Happy Sundays with others! If your eyes click when you hear photography, this is the place to be! Not only can you capture this Sunday of Spreading Happiness, but also give memories to different families by clicking portraits. Showcase your artistic skills like Handicrafts making, Dancing, Singing, Music and many more. We are sure you will go back home with the contentment of spreading smiles. Exhibit your best work at The Bombay Store. Because customers would love to shop from some quirky, kitschy, funky and jazzy items. Give the participants an enjoyable and enriching experience as you pass on your inquisitiveness about learning something new to them. If we are missing out on a talent that you have & would want to showcase, register on the app and write a message about your brand in the message field. Once done, all you have to do is hit the ‘Submit’ button. 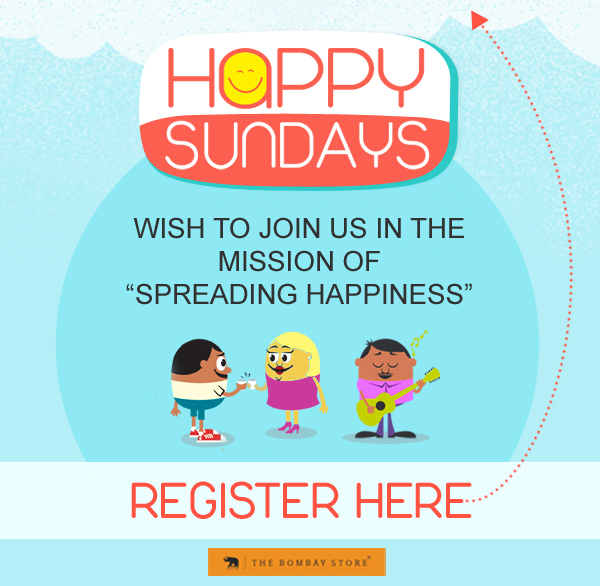 If you wish to be a part of this bandwagon, Register now at Happy Sundays. Don’t delay, because good things may not always come to those who wait.